The huge increase in the use of ontologies and Semantic Web data has increased the need for usage-related information to assist stakeholders (or users) to make effective use of currently available semantic information. As noted in earlier chapters, stakeholders can be different groups of users such as ontology developers, domain experts, application developers and data publishers, each of whom will have a view-specific requirement of the same information. The identification and investigation phases of the OUSAF, discussed in Chaps. 4– 6, help us to identify and measure usage-related information. However, once the usage-related information has been determined, it needs to be presented to stakeholders in a structured format; providing granular access to ontology usage-related information therefore meets the needs of each stakeholder. 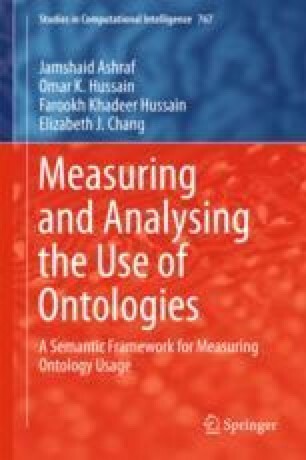 This is done in the Representation phase of the OUSAF, in which an ontology usage ontology (the U Ontology) is developed to represent ontology usage analysis-related information. In this chapter, the conceptual framework of the U Ontology is presented.